We spend a lot of time bashing sugar here at The Alternative Daily. Along with trans fats and factory-farmed meat, it’s basically enemy number one. But did you know that there is a product made from sugar cane that is considered a superfood? It’s called blackstrap molasses, and it’s essentially the antithesis of refined white sugar. That’s because blackstrap molasses is what’s left behind when nearly all of the sugar is processed out of the sugar cane. Blackstrap molasses encompasses most of the nutritious parts of the sugarcane plant, like the vitamins and minerals. Historically, blackstrap molasses has been used as somewhat of a cure-all, for problems like constipation, anemia and ulcers. There is wisdom in this time-honored approach, since modern research and analysis shows that blackstrap molasses contains an impressive array of nutrients which can help support numerous functions within the body. Some of the highlights include vitamin B6, manganese, magnesium, potassium, iron and selenium. Blackstrap molasses also provides some calcium, copper and chromium. The vitamins and minerals in the molasses occur in natural proportions since it comes directly from the sugarcane plant. As we have often discussed, nutrients are always better absorbed from whole food sources with the various cofactors and phytochemicals that come along with them. Blackstrap molasses could therefore be classed as a whole food supplement. While it should still be considered a sweetener to be eaten in restricted amounts (like any other of our favorite “healthy” natural sweeteners), the wide range of beauty and health benefits make blackstrap molasses a good daily choice. 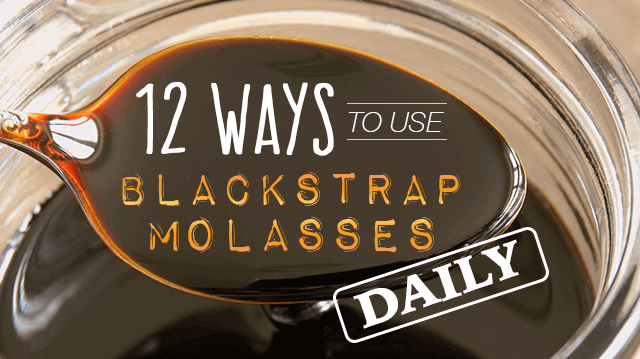 Here are 12 smart ways to incorporate blackstrap molasses into your wellness regime. While formal scientific evidence is lacking, thousands of testimonials point to the hair-enhancing benefits of blackstrap molasses, including softer texture, reversal of grey hair and reduction of hair loss. These effects are likely thanks to the anti-aging antioxidant minerals found in blackstrap molasses, which include selenium, manganese and zinc. Copper is also needed for healthy hair and to produce the pigment that gives hair its original color. Consuming one to two tablespoons of blackstrap molasses in water will act as an internal remedy for better hair. Another option is to dilute it with water and then apply it as a conditioning treatment for 15 minutes before rinsing clean. Blackstrap molasses is celebrated for a variety of skin-related benefits, including anti-aging, exfoliating and softening. It is also used as a remedy against skin conditions such as acne, eczema and rosacea. To use blackstrap molasses as a nourishing face wash, simply dilute slightly with water and apply to the skin. Leave it on for five minutes, then rinse with warm water. Many women recommend blackstrap molasses as a fast-acting remedy against painful or heavy periods. The unique blend of vitamins and minerals serves to ease pain and replenish the body to provide relief. Those suffering with menstrual pain say that drinking a cup or two of hot water or tea with blackstrap molasses will help ease discomfort within 20 to 30 minutes. Using blackstrap regularly should help reduce the severity of menstrual issues over time. One of the most delicious ways to incorporate blackstrap molasses into your routine is to bake with it! Gingerbread or spiced molasses cookies are the obvious choices, but other recipes that complement the dark, earthy, bittersweet flavor of blackstrap will work great. Try loaves, muffins or pies incorporating pumpkin, apple, raisins or pecans. We recommend baking with grain-free flours and meals such as those made from flaxseed, coconut, almonds, and arrowroot, etc. Savory dishes are also delicious with a little bit of blackstrap. Try glazing sweet potatoes or carrots with some butter and molasses for an appealing sweet flavor. Another way to use blackstrap molasses in the kitchen is to incorporate it into homemade condiments. Barbecue sauce is a popular option, as are marinades and glazes for pork or chicken. Also try mixing up a salad dressing with blackstrap molasses and balsamic vinegar. If you make your own nutritious breakfast incorporating oatmeal, yogurt or granola, why not sweeten it with blackstrap molasses? It’s a mineral-rich alternative to the honey or maple syrup that you might normally use. Blackstrap molasses makes a great binding agent for recipes such as homemade power bars or energy balls since it is so sticky. Try replacing some or all of the honey or maple syrup in your recipe with blackstrap molasses to add a deeper flavor and a nutritional boost. It goes great with ingredients such as dates, cinnamon, almonds and raisins. Having some blackstrap molasses in the morning will set you up well for the day by helping to balance stress hormones, stimulate digestion and detox, and regulate blood sugar. The potent mineral mix found in blackstrap molasses can also help relieve many chronic conditions, such as constipation, trouble sleeping and restless leg syndrome. Tooth pain and growing pains are also said to see improvement from daily use of blackstrap molasses as a tonic drink. It’s as easy as consuming one to two tablespoons in the morning. This can be mixed with lemon juice or apple cider vinegar in warm water, if you wish to combine the treatment with other remedies you use on a daily basis. Alternatively just swallow the dosage directly from the spoon and wash down with a beverage of your choice. An enjoyable way to consume a daily dose of blackstrap molasses is to mix a spoonful into your customary morning coffee or tea. Although the bittersweet flavor pairs well with coffee, you may need to experiment with different types of tea to find a combination that tastes agreeable. Try using blackstrap molasses daily to help relieve symptoms of arthritis. This healthy sweetener alleviates joint pain in a few different ways. First, blackstrap molasses brings down swelling in joints by activating anti-inflammatory mechanisms. Second, it supports bone and connective tissue health in general by providing a whole-food source of minerals such as calcium, iron and copper. Enjoying blackstrap molasses in any of the drinks or recipes we have discussed above will provide beneficial support for arthritis sufferers. Another way to benefit from blackstrap molasses on a daily basis is through the relief of ADD and ADHD symptoms. This is thanks to the minerals found in blackstrap molasses, which correspond to deficiencies seen in people who suffer from these conditions. Zinc, magnesium, calcium, iron and B vitamins may help support the nervous system and brain function to improve focus and optimize mood and behavior. Try incorporating this awesome natural remedy into your daily routine. It’s so easy to see benefits when you can enjoy blackstrap molasses in so many different ways! Check out more ideas here. 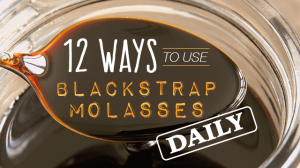 Hey Buddy!, I found this information for you: "12 Ways to Use Blackstrap Molasses Daily". Here is the website link: https://www.thealternativedaily.com/use-blackstrap-molasses/. Thank you.